L'il Dee's Crafting with a Kitten: Phew...That was close!!! I skipped Christmas shopping tonight so I could get this card made and posted. I'm fighting off a cold and really didn't feel much like shopping tonight, especially after working all day. I also had to wait for my husband to be done on the computer in order to post this. I really wanted to try another card with some different colours for Christmas. I love the Colourful Christmas line from My Mind's Eye. I'm not sure what year this is from but it's a couple of years old I think. The image stamp is a wood mounted stamp by inkadinkado and the greeting stamp is from Stampin' Up. 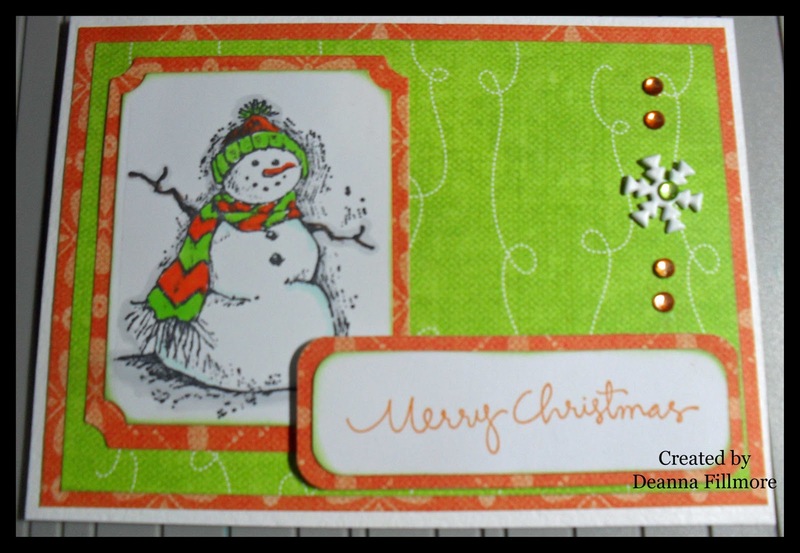 I stamped the image and cut it out with spellbinders small labels and the mat for it using large labels. I coloured the image with copic markers (YG25, YR07, E25, BG10 & N1). 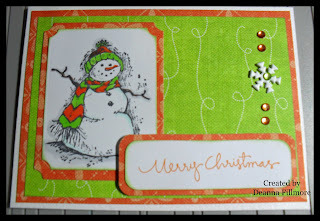 I used tangelo Memento ink for the greeting and I edged the image and greeting with versa magic tea leaves. I coloured the rhinestones with YG25 & YR07. That's it for tonight, I hope to be back with another card before Friday LOL. Have a great day everyone and thanks for stopping by.